Just a heads-up that QCharts 6.1 Beta is now available for testing. Please head over to the QCharts Beta Testing forum for more details. QCharts 6.1 Release Candidate has been put up on the QCharts Download Page. This will be very close to the version to be released next week as a full gold release, however we typically put up an early preview version for those early adopters who wish to get a head start on the version. Full release notes for QCharts 6.1 will be available next week with the Gold Release. Thanks to all the beta testers for the great feedback through the 6.1 beta cycle. I'm pleased to announce that QCharts 6.1 has been launched and is now immediately available on the QCharts Download Page. Head on over and grab the new update today! As announced in a recent post, QCharts 6.1 is a required update. All QCharts users are recommended to update to 6.1 by October 26, 2009. If you haven't already upgraded, be sure to take a read-through of that announcement. Hot Lists are powerful pre-built scans that look through the markets to identify the best trading opportunities and update them automatically every 30 seconds. There are the traditional gainers, losers and volume lists here but also unique scans, such as Unusual Volume, Most Volatile and Trade Rate Hot Lists, the last of which displays the fastest-trading stocks in the previous minute. This allows a momentum trader to see what is moving right now and react accordingly. Sector Lists are a quick way to pull up symbols that are in specific sectors. This unique feature will insert symbols into a quote sheet for additional sorting and analysis. 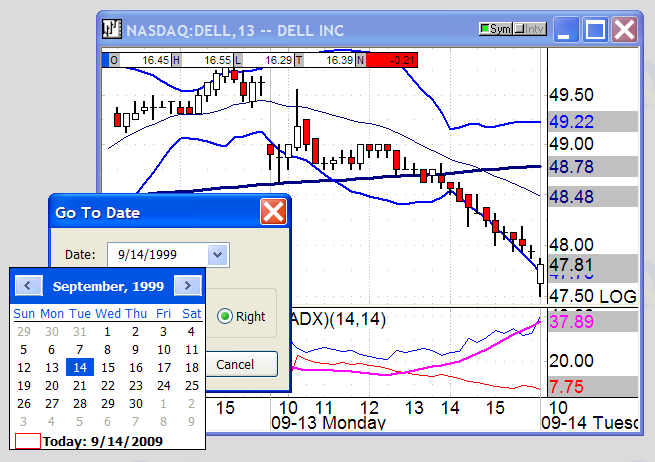 For example, you open your workspace in the morning and notice that the Dow Utilities is up strong. 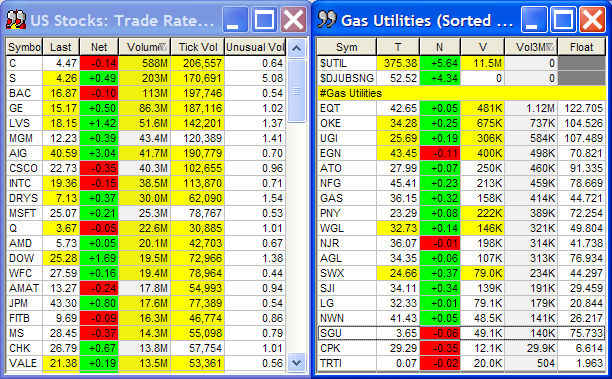 Digging further, you notice that natural gas is making a move favoring the providers in that sector. By clicking on the â€œImport Sector Listsâ€� icon, you access the complete list of companies in that business space for further investigation. In addition to adding numerous lists, weâ€™re also adding 50+ new data fields, such as Short Interest, Float, 12 Month % Total Return, % Insider Owned, 200-Day Moving Average and many more. We do know that not all data fields have been carried over from the Continuum network, so we are actively working toward bringing them to the eSignal network in a forthcoming 2010 release. We have had many requests from the QCharts community for the ability to add multiple Comment fields to the QCharts Quote Sheet window. The ability to include multiple layers of notes per symbol ensures that your trading evaluations, stop levels, entry points and other annotations can remain organized. In some of the situations where QCharts was pausing during the market, we found that the Time & Sales window was downloading excessive amounts of data when compared to the amount of data commonly looked at using this window. We also took this time to scrutinize how data was being internally stored and worked on ways to improve it further. The result is much improved speed with a focus on being able to change symbols quickly. Nearly all QCharts clients use multiple charts, and those who use line tools create more than one line on a chart. As such, we looked at ways that lines could be edited together to save time. We came up with three different ways this could be accomplished (via a right click of a line). 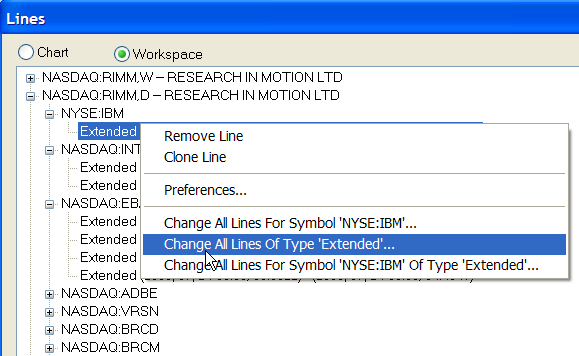 Change All Lines for Symbol â€“ This allows you to change the characteristics of all trend lines on the specific symbol. Change All Lines of Type â€“ This allows you to change the characteristics of all trend lines for the chosen type. Change All Lines for Symbol of Type â€“ This is a combination of the above two. One thing to note about this feature is that you can choose to edit the lines from a chart via a right click or go into the Edit Lines function and choose Workspace. Changes in this mode will take place across the entire workspace versus within only the selected chart. There is a new option for displaying the time labels at the bottom of an intraday chart. Under View -> Preferences, the Display tab has a new option called â€œAbbreviate Time Labelsâ€�. When checked, QCharts will behave in its usual way. When unchecked, the scale will expand to include more precise labels based on the actual times of the bars and the selected intervals. You now have the ability to scroll back to a specific time in a chart quickly with the new â€œGo To Dateâ€� function in charts. This can be found via the right-click menu. Using this, in combination with the extended intraday data launched with QCharts 6.0.3, thereâ€™s no need to scroll back and further back with your mouse or with the arrow keys. Youâ€™ll be able to jump back precisely with a single command. The â€œSet equity display precision to two decimal placesâ€� option (also found under the View -> Preferences, Display tab) will now round most technical studies to 2 decimal places. This saves precious screen real estate for more of the information thatâ€™s important to you. QCharts.com's Download Page was updated this afternoon with a 6.1 maintenance release that permanently addresses the red "Entitled" issue that appeared in the middle of this month. While the outage of 10/14 was a server-based network event, we have written in additional protections against this problem in case this type of problem was to reoccur. There was one other issue that was cleaned up in this release, which was a problem with the F2 options screen in the Login window. On occasion, the settings in this options screen would blank out or become corrupted, leading to unusual behavior in the QCharts application. We have now moved these settings to a more stable part of the operating system (i.e. Windows Registry) to nearly eliminate the possibility of such an issue occurring again. QCharts 6.2 is now available on our Download Page. All QCharts users who trade equity / index options will need to download QCharts 6.2 by February 1, 2010. QCharts 6.2 has been made ready to receive options data according to the new Options Symbology Initiative (OSI) and will begin to display options data in the new format on or before February 1, 2010 when the new symbol structure goes into effect. From that point on, QCharts will display options in this new symbol structure only. QCharts 6.2 Maintenance Release is now available. This contains a small series of fixes for the product, the most vital being a correction for pulling in Index Options. - Index Option Montage and Chains are now updating as expected. - The expiration month format has been changed back to its original format. We have released a new version this morning that has an important change for Forex users as well as an improvement to the email alert system in QCharts. Please head on over to the QCharts download page to get the latest version. - Email authentication has been added to support ISP's and email clients that require a username and password through SSL. Today, we posted an important maintenance release for all QCharts users. This required update is the result of the upcoming shutdown to the legacy Continuum network on December 30, 2010. Not updating to the latest version could cause a service interruption after 12/30. There is a new format for the Breadthalizer symbols on the eSignal network. All former QC: based symbols will no longer function on QCharts 6.2.1, and they will need to be converted over to this new format. As with all index symbols, these start with a dollar sign ("$"). This is then followed by the symbol for the type of statistic you want (e.g. Need Total Volume? Use TVOL). You will then need to place a period followed by the two letter code for the market (e.g. NYSE = .NY, US Stocks = .US). The end of all of these symbols are followed by a "-ST". Here are a few sample symbols to get you started. If you'd like to see a complete list, click on Quote Sheet --> Import --> Symbols, and navigate to the Breadthalizer folder. We have released a new version for QCharts users that addresses a problem in the Browser Window. The Home Page address can once again be properly set under View --> Preferences, Browser. Please head on over to the QCharts Download Page to update your installation.